Hamas launched a month-long campaign urging alleged Arab "collaborators" with Israel to turn themselves in return for leniency. 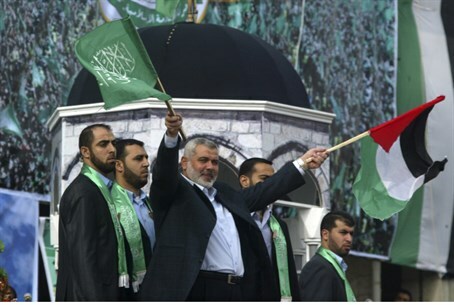 Hamas rulers in Gaza launched a month-long campaign on Tuesday urging alleged Arab "collaborators" with Israel to turn themselves in as a means of being granted leniency. "We announce the opening of the door to repentance for remaining collaborators and for all those who have fallen into the traps set by the enemy's intelligence services," interior ministry spokesman Islam Shahwan told reporters, according to the AFP news agency. "We urge them to return to the bosom of their people and their families," he said, noting that the offer of clemency was open until April 11. All execution orders must be approved by the Palestinian Authority before they can be carried out, but Hamas no longer recognizes the legitimacy of incumbent PA Chairman Mahmud Abbas, whose four-year term ended in 2009. Following the recent November conflict, Hamas announced the creation of a committee to examine the "unlawful executions" of Arabs accused of spying for Israel. Seven people were gunned down after being accused of being collaborators. The bodies of six of them were dragged behind vehicles through the streets of Gaza City. The killings were claimed by Hamas terrorists from the Ezzedine al-Qassam Brigades and notes were pinned to the bodies reading: "Al-Qassam Brigades announces the execution of the traitors," according to AFP.